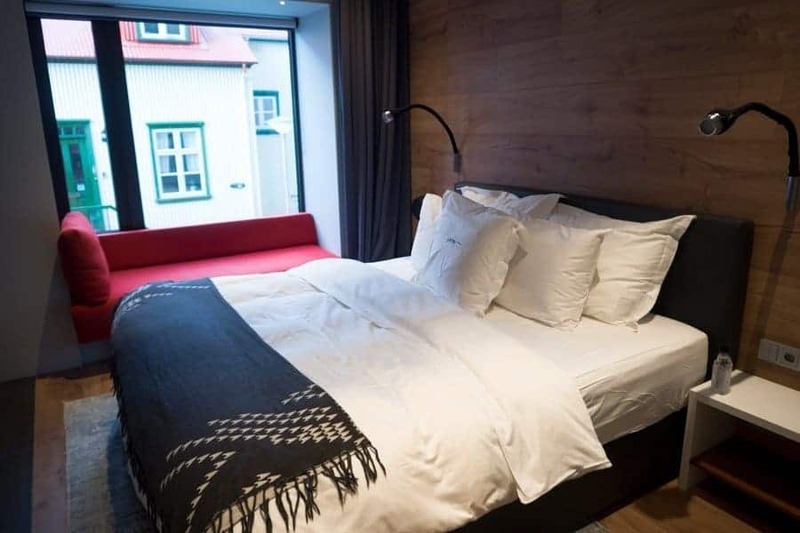 Iceland offers a variety of accommodation options. 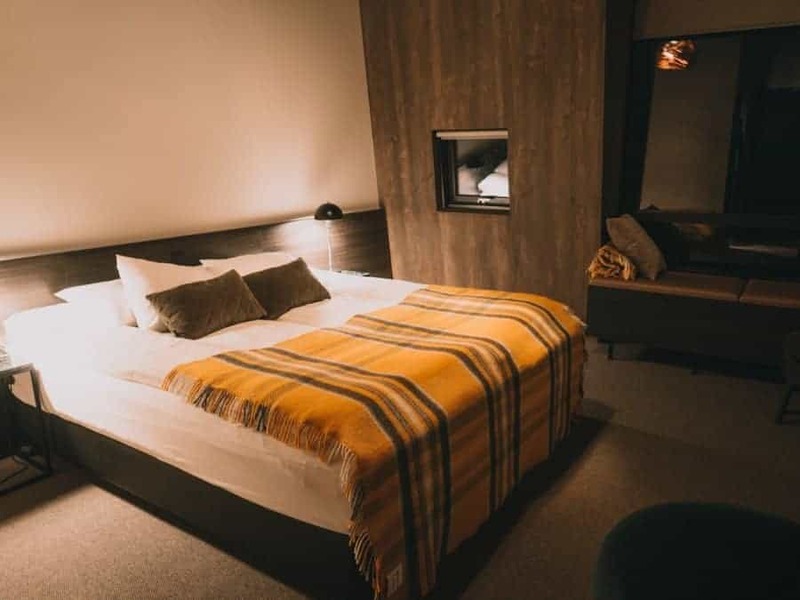 Being such a tiny country there are, however very few high-end luxury hotels on offer, particularly outside of Reykavík. There are no big luxury chains like Four Seasons or Shangri-La. They do however offer some great boutique hotels. 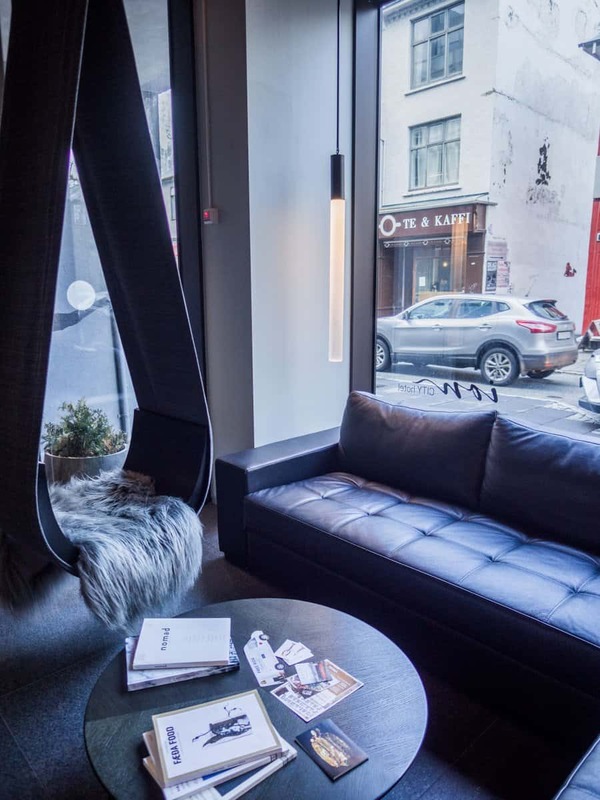 So, if you’re looking for the best boutique hotels for your next visit, look no further. I’m a big fan of independent travel. I rarely book pre-organised tours or through a travel agent. I do all my own research and always book my own accommodation. I did quite a bit of research before my trip. I must have checked out every one of the Iceland hotels on offer. We chose to spend a few days in Rekjavík before setting off on a road trip. 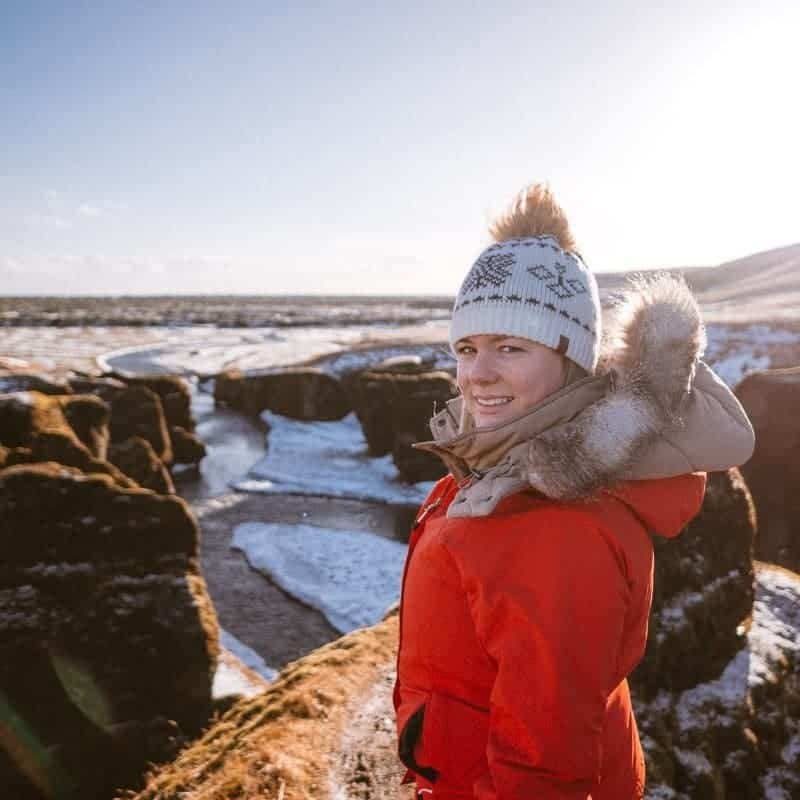 We only had 7 days, which wasn’t quite enough time to complete the full ring road, so we thought the Golden Circle and South Coast routes would be a nice alternative. Finding good boutique hotels on this route was challenging but not impossible. 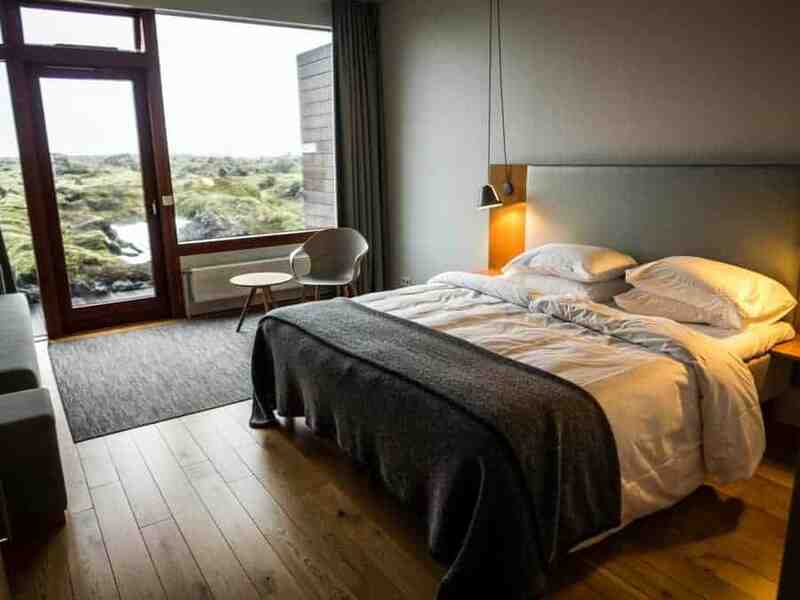 So here is a list of what we considered to be the best luxury Iceland hotels available. I booked most of them about 3 months prior to arriving. At that time I did find it challenging to get the original dates that I wanted and had to rejig our itinerary a little to secure bookings. I would definitely recommend booking well in advance. 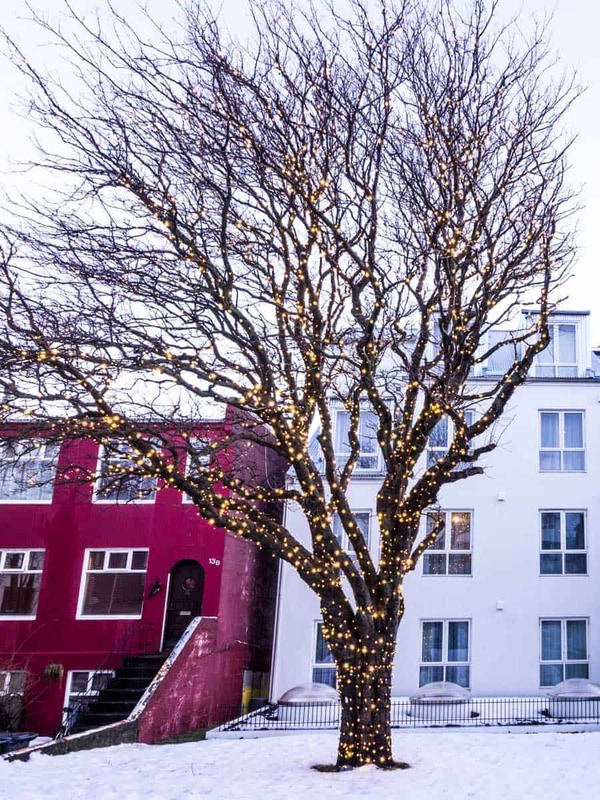 Iceland is very popular and availability for accommodation is very limited – even in winter. Sandhotel in Reykjavík was possibly one of my favourite of all the Iceland hotels that we visited. Located right in the centre of town, close to plenty of good restaurants and cafes. Sandhotel was a great place to start our Iceland tour. Our room was very spacious and the modern luxe decor was absolutely beautiful. 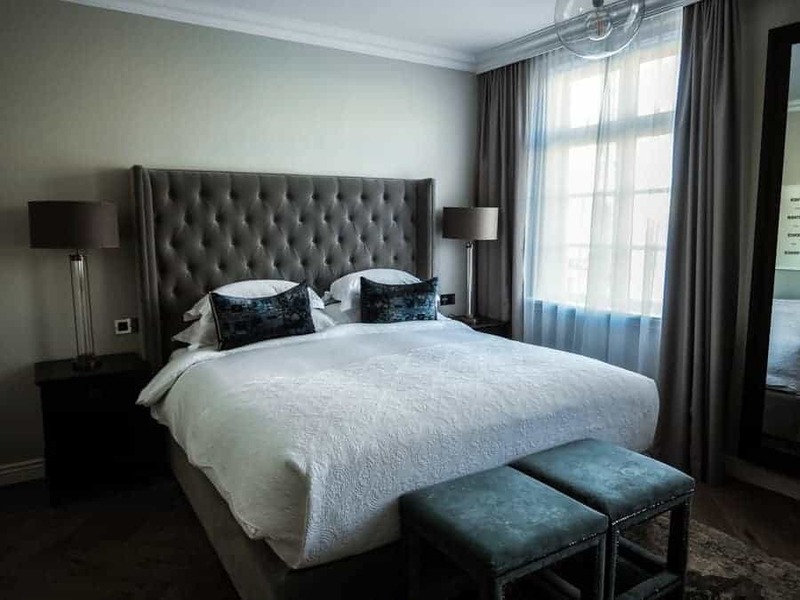 It featured a massive comfortable king size bed, with pillows and sheets that you just sink into, along with designer lighting, USB outlets (I really hate it when hotels don’t provide enough of those), fluffy robes and blackout curtains (good for the jet lag). The bathrooms were decked out with marble and the lobby featured comfortable lounges that you could lounge around all afternoon playing board games in front of the open fire. The staff at the front desk were really friendly and helpful, organising day tours and researching information on weather and aurora activity for our road trip and northern lights hunting expeditions. We didn’t actually eat breakfast in the hotel restaurant because there are so many good options around town that we wanted to try. We did, however, quite frequently eat at the bakery next door, called Sandholt (I think it may be affiliated with the hotel), which served amazing pastries, artisan bread, and great coffee. The only negative we could find with the hotel was the noise factor. 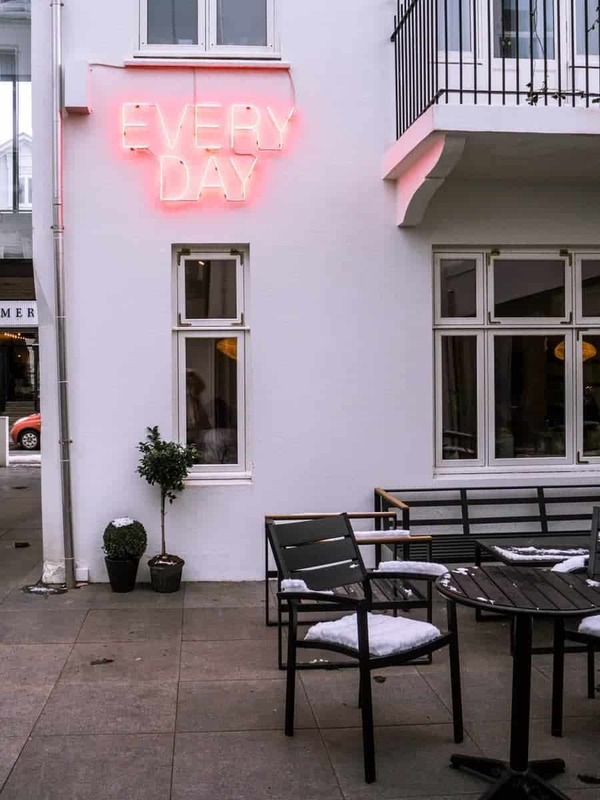 It is located right in the centre of Reykjavík and we stayed on a weekend, which is peak party time for the locals. The rooms are insulated but not completely soundproof. We couldn’t hear general street noise during the day but we did hear music coming from the nearby clubs and bars at night. I wouldn’t let this deter you from staying here though because the location of the hotel was really great. You might just want to bring a set of earplugs if you’re staying on a weekend. 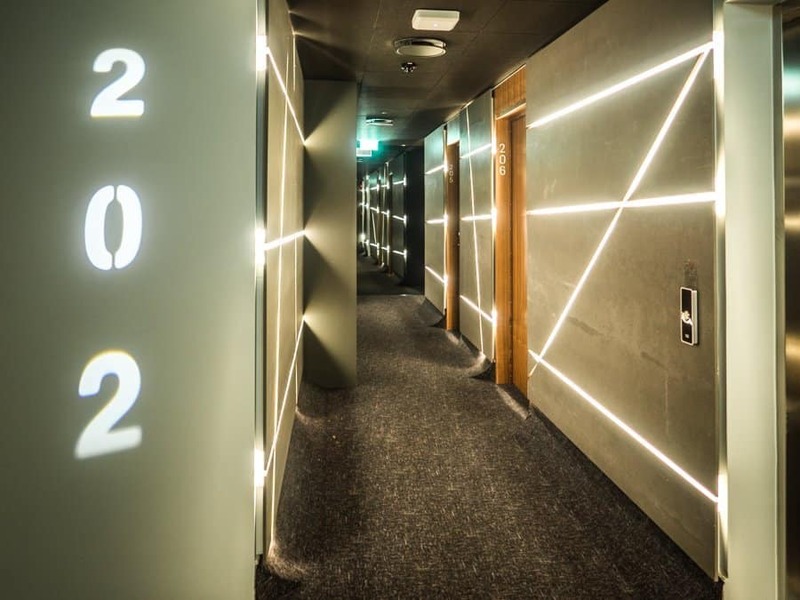 The Ion Adventure Hotel is Insta-famous, which is exactly how I found out about it. 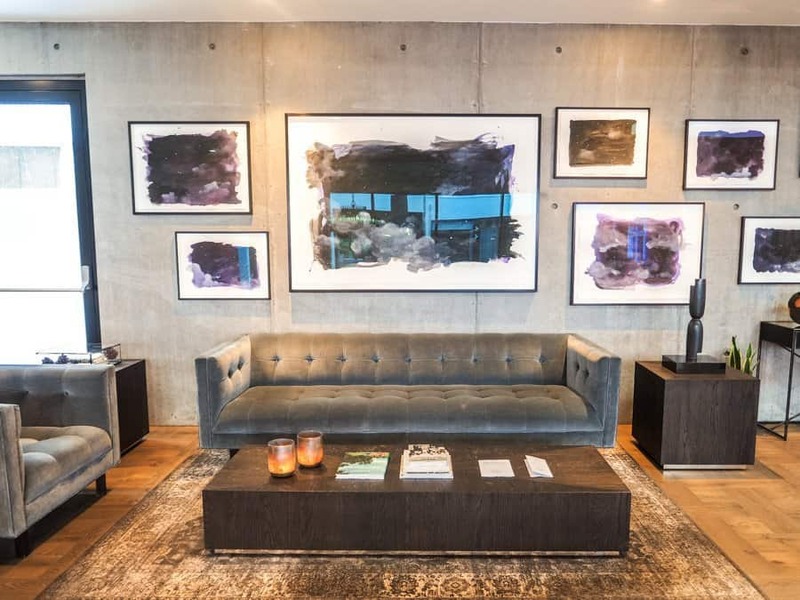 It’s also one of the best Iceland hotels located outside of Reykjavik and gets booked out quickly. We had a lot of trouble booking the dates we wanted so I would definitely recommend booking well in advance. It also seems to be popular with large tour groups. We had 2 or 3 tour groups staying at the same time as us and once they arrived in the late afternoon; the pool, sauna and restaurant filled up very quickly. Our stay here was very pleasant. The staff were really friendly and accommodating. We were offered a glass of sparkling wine on arrival, which was a welcome touch after a long day of driving around the Golden Circle. 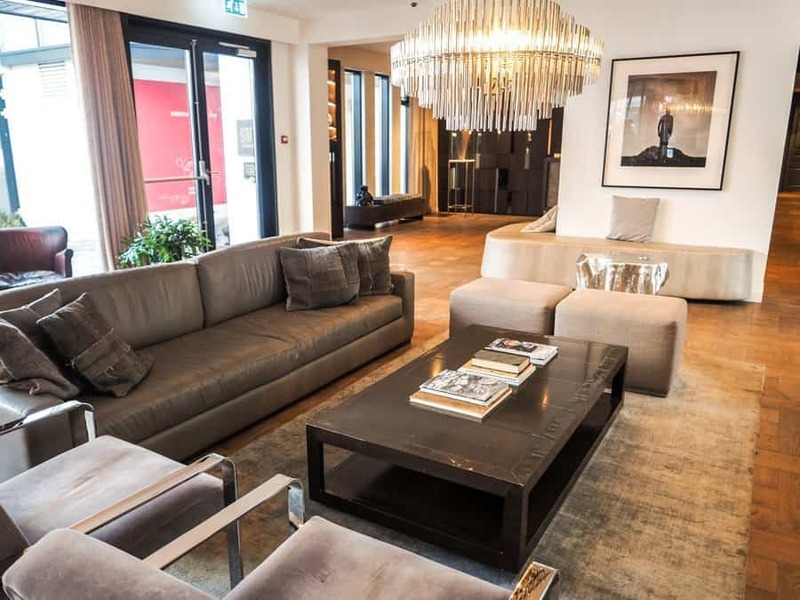 The rooms were simple but comfortable with Nordic luxe styling – this style seems to be standard amongst luxury Iceland hotels. 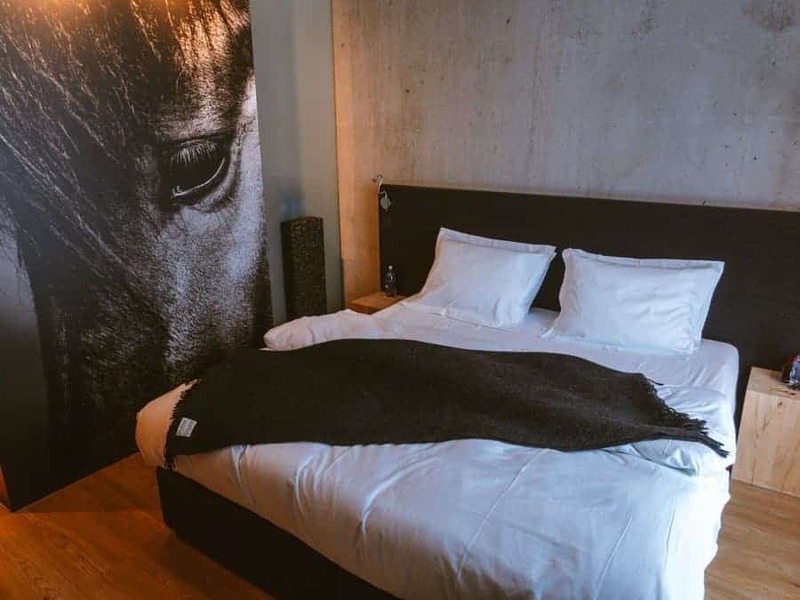 I loved some of the Icelandic style finishings, such as sheeps skins on the beds and a massive black and white photo of a gorgeous Icelandic horse on the wall. Unfortunately, our stay here coincided with a fierce storm brewing so the normally picturesque outdoor heated pool (that you’ve no doubt seen on Instagram a thousand times) was not so beautiful and warm. But that’s just how the weather is in Iceland – unpredictable. We splashed around a little and tried to get some photos before realising that outdoor hot tubs are not much fun in gale-force wind, so we retreated to the sauna. The food at Ion Adventure Hotel was superb. Better than any other Iceland hotel we stayed at. 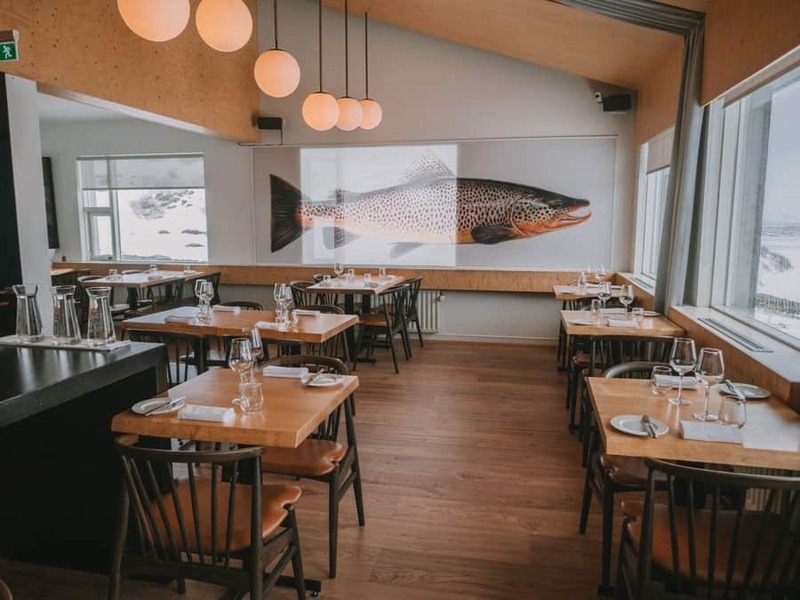 The menu featured authentic Icelandic style delicacies, such as Langoustine and slow-cooked lamb and there were very good vegetarian options too. Just be aware that you have to book a table early as it the restaurant quite frequently books out and there are no other places to eat nearby. The Ion Adventure Hotel is located in a remote region near Thingvallavatn on the Golden Circle. 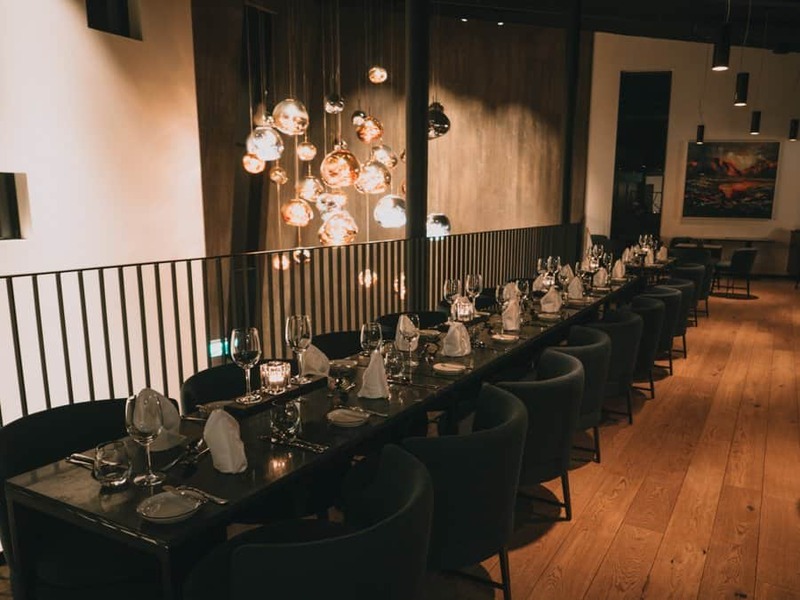 It is about 1 hours drive from Reykjavík and is one of the only boutique hotel options on the Golden Circle. The scenery around this area makes for an absolutely stunning drive. After an eight hour drive from Ion Adventure Hotel to the Glacier Lagoon (normally five hours but we made several stops along the way to take photos, because Iceland is so photogenic), we were so relieved to arrive at the Fosshotel. The hotel is actually located about 20 minutes drive west of the Glacier Lagoon in an area that is slightly more protected from the elements. We reached the hotel around sunset and chose to continue driving to the Glacier Lagoon so we could take photos at Diamond Beach during sunset. By the time we arrived at the hotel, we literally ate and fell into bed. We opted to stay here for two nights, as there was so much to see and do around the Glacier Lagoon. I had a few issues with my booking as I had changed the dates through my booking agent, who made an error and changed it to the wrong date. The staff at Fosshotel were so helpful in correcting the error and offered me a discount on my stay as a result. Now that is the kind of service I love to receive when I stayed at luxury hotels. The rooms at Fosshotel were simple and comfortable. We had a room with a view towards the valley, on a clear day you can see all the way to the ocean. They also offer a Northern Lights wake-up call option. Given the remote location of the hotel, the Northern lights can be seen right from your room. Fosshotel is one of the largest Iceland hotels we visited. Due to its location, it generally caters to tour groups stopping for one night on their way through. As a result, the restaurant gets booked out quickly so if you want an early meal, I would recommend making a booking as soon as you arrive. The food was very good but expensive. Although, everywhere is expensive in Iceland. Given the remote location, there are not many other options. The closest town is Hofn, about 40 minutes drive from the Fosshotel. Be careful not to confuse the Fosshotel Glacier Lagoon with the other Fosshotel’s located around this area. The brand appears to have several accommodation options within reach of the Glacier Lagoon. I cannot speak for the others, but the Fosshotel Glacier Lagoon was definitely a good option in terms of luxury hotels in Iceland and I would definitely stay here again if I ever return. 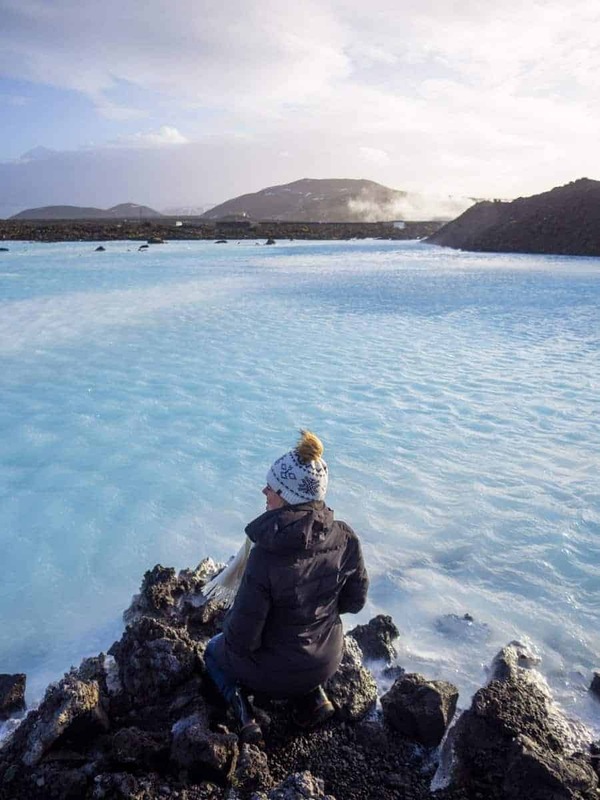 Planning a visit to the Blue Lagoon? Then this is one Iceland hotel you don’t want to miss! Yes, it’s pricey (after all we’re talking luxury hotels here, not budget ones). 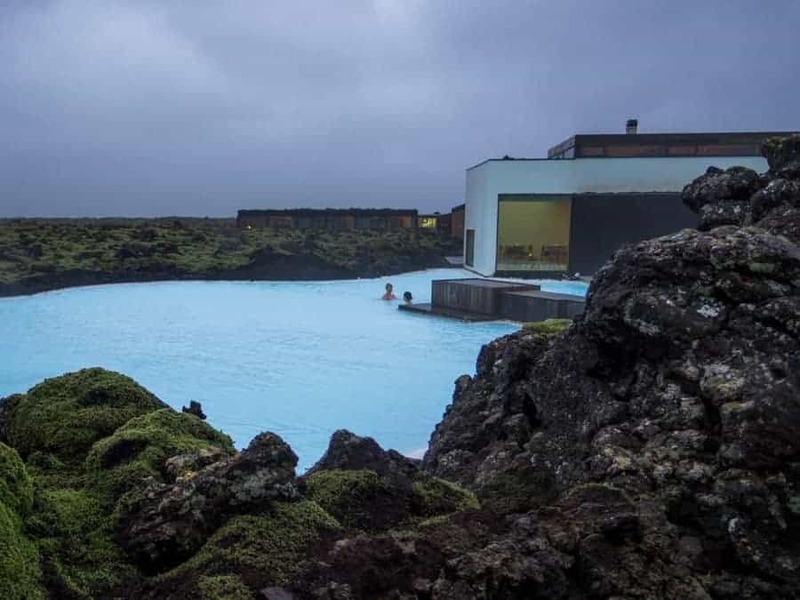 But after visiting the actual Blue Lagoon and seeing how packed it was with tourists, we were so relieved to have booked a night at the Silica Hotel. The hotel features its own milky blue lagoon that wraps around the lobby area. The experience of being able to change into my swimsuit and robe in my hotel room and hopping straight into the hotel’s very own private lagoon with virtually no other people in it was priceless! 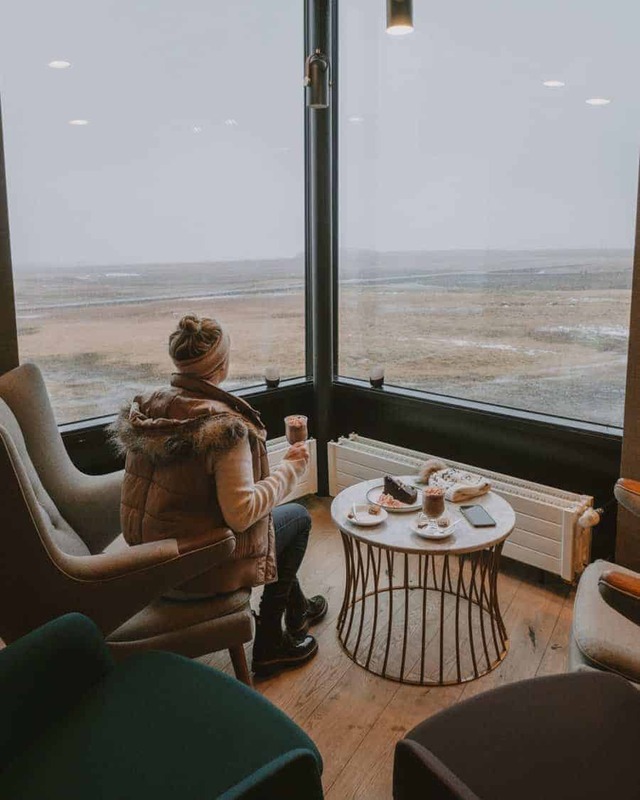 In fact, staying at this Iceland hotel was such a highlight, we created an entire blog post and video to showcase our experience at the Silica Hotel. 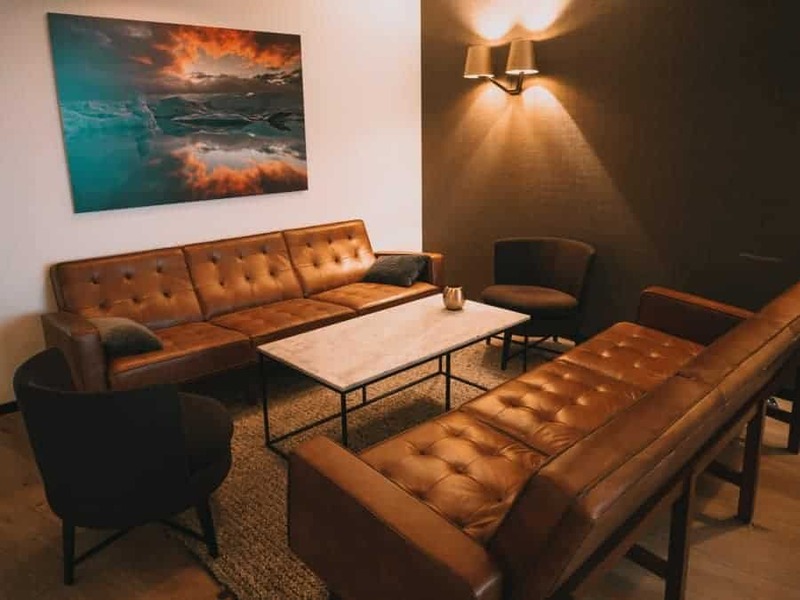 And if that’s not enough to convince you that you must book a stay here on your next trip to Iceland, then check out our article that was recently featured on WeAreTravelGirls.com; 9 Reasons Why You Must Stay at The Silica Hotel on Your Next Trip To Iceland. 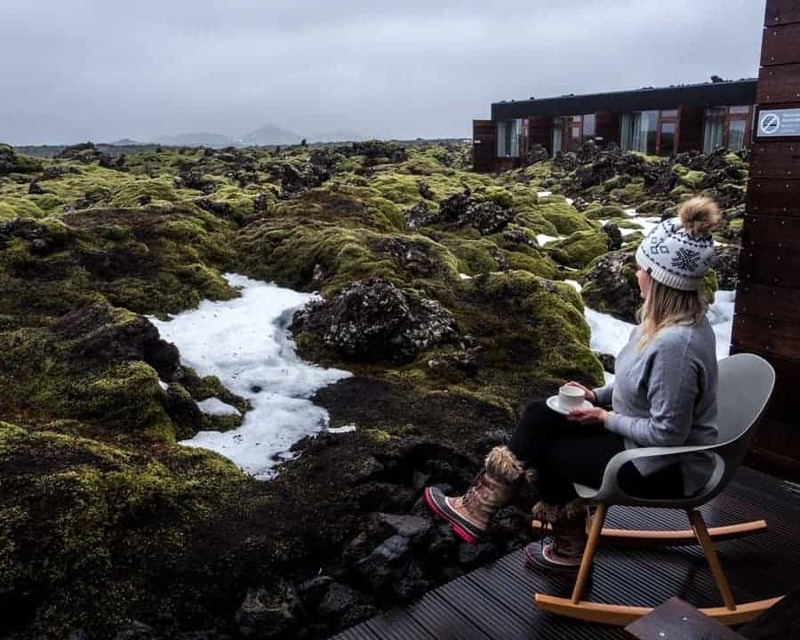 At the time that we visited, one of the only 5-star ultra-luxury Iceland hotels, called The Retreat, was being constructed at the Blue Lagoon. It was due to open in April 2018, with each room featuring its own private lagoon. I really wish I could have experienced this property. 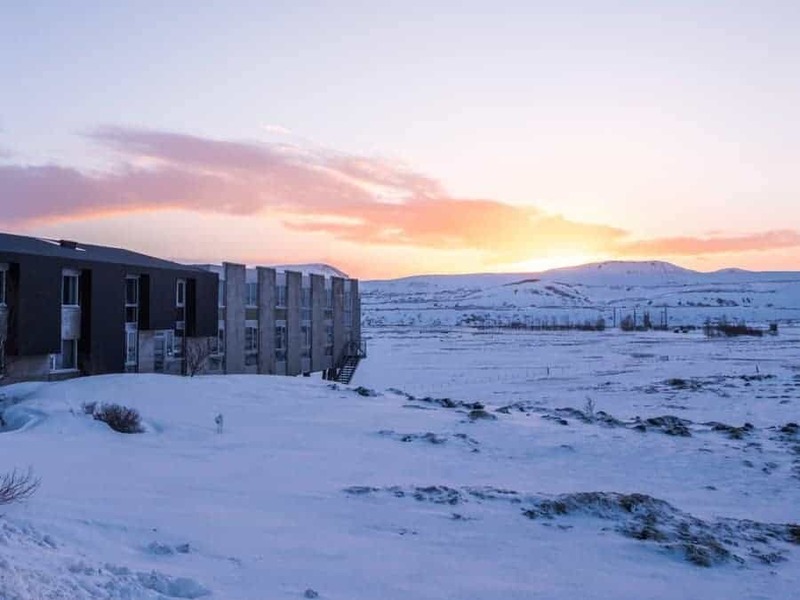 Once it opens it will be one of the best luxury hotels that Iceland has to offer! Maybe we’ll just have to come back! 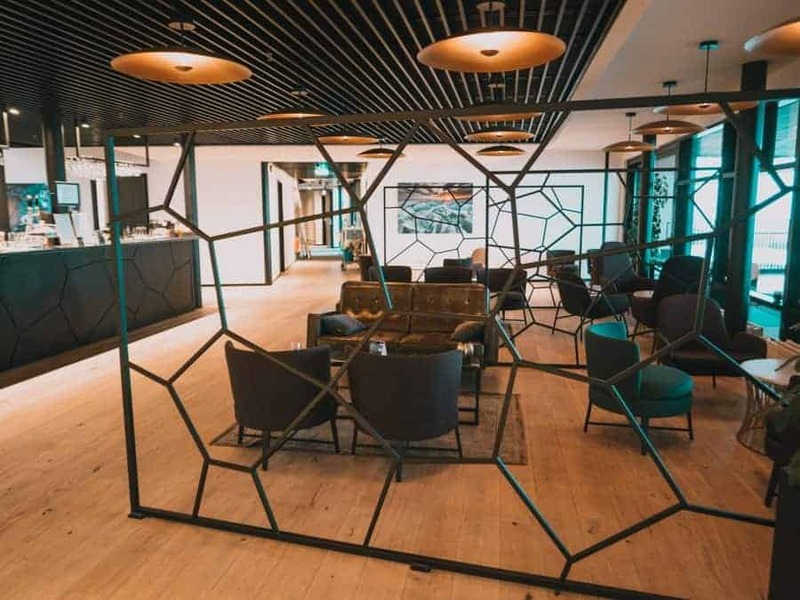 After a great experience staying at the Ion Adventure Hotel, we decided to spend our last night in Iceland at their sister property, the Ion City Hotel in Reykjavík. We were (again) treated to a glass of sparkling wine upon arrival. We took our bags to our room then headed back down to the reception area where we sat by the window people watching and enjoying our glass of bubbly. The staff were very friendly and helpful with making restaurant bookings and confirming our airport transfers. 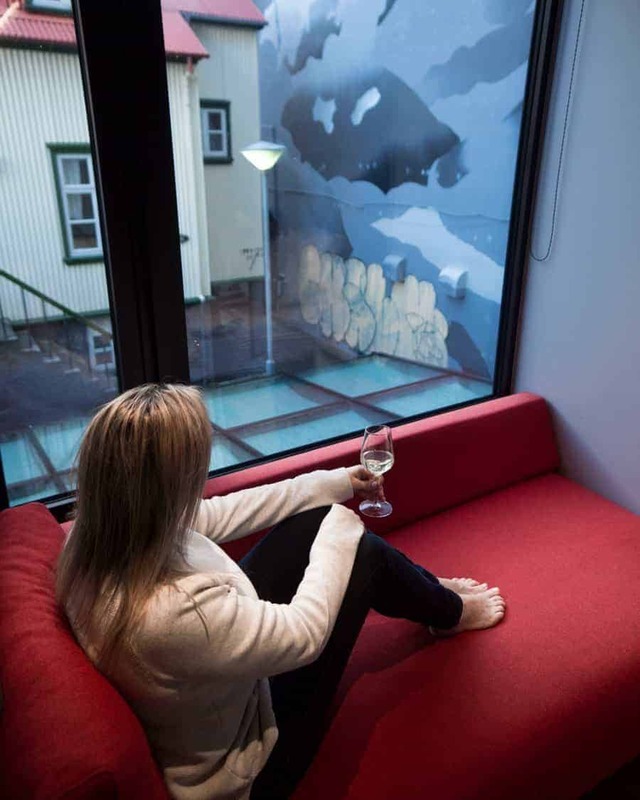 We actually found this kind of service to be the norm at many Iceland hotels. Tourism is big industry in Iceland and for such a tiny island nation, they do a really good job at accommodating visitors needs. The rooms at Ion City Hotel were quaint and stylish with free alcoholic beverages, a Nespresso machine and good selection of herbal teas. I really loved the bath products on offer at all of the Ion group of hotels. It’s hard to find hotels that have good quality bath products that don’t dry out your skin or hair. The Ion City Hotel was also located in the main entertainment district of Reykjavík so we were a little concerned about the noise, however, our room was located towards the rear of the building so we didn’t actually hear anything at all. The food at Sumac restaurant, adjacent to the Ion City Hotel looked absolutely amazing, but unfortunately, we didn’t get a chance to eat there, as we were so tired from our road trip and had to be up at 4 am for a flight. 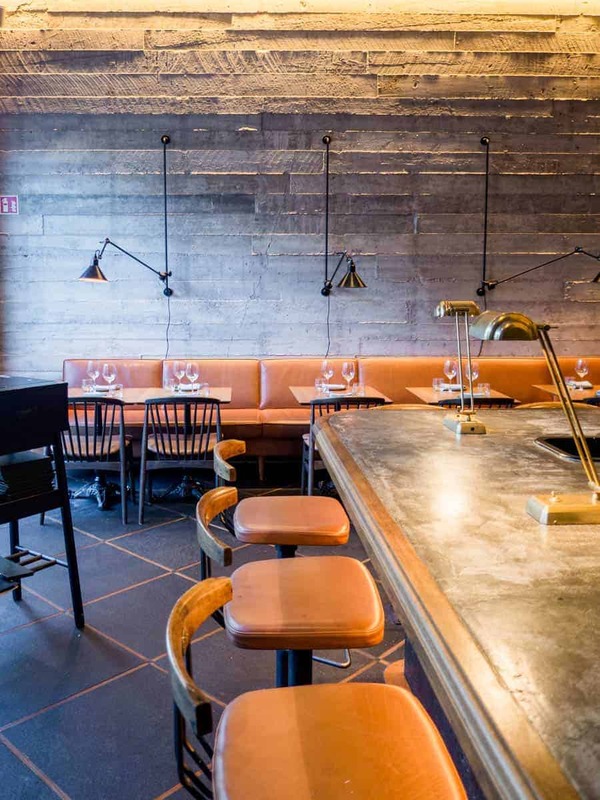 But it is definitely on my list of restaurants to check out during my next visit. 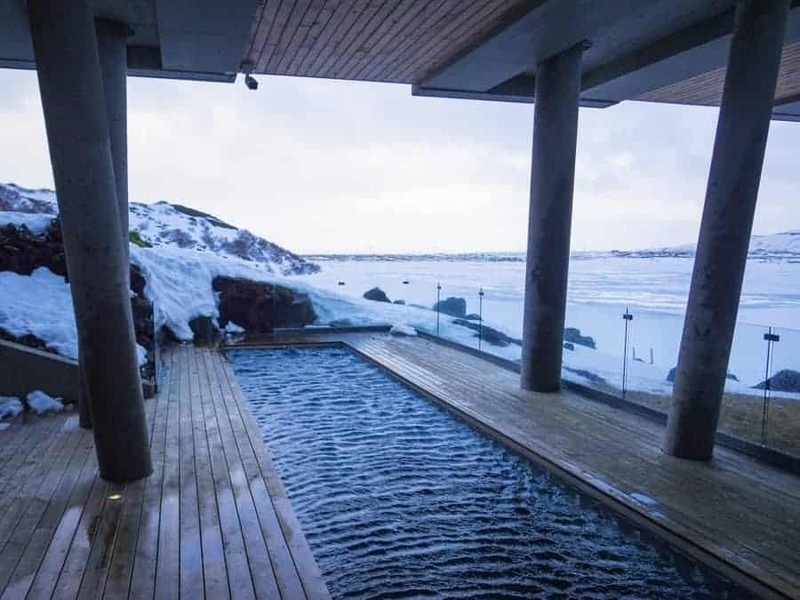 Have you stayed at any other luxury Iceland hotels that you would recommend? We’d love to hear about them in the comment section below. So amazing! I can’t wait to go to Iceland one day! Your photos are stunning-as always and I love your video too! Thank you so much Lindsay. Iceland was possibly one of my favourite countries that I’ve been to. I’m actually working on another video of my entire Iceland Road Trip which I hope to have up soon, so watch this space! Girl, I think I just died and went to Icelandic luxury heaven! :0 Oh my!!! Haha, glad my article makes you feel that way! We honestly stayed in some amazing places. Can’t wait to go back!